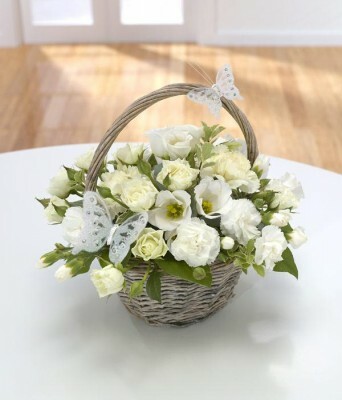 A basket arrangement that even the butterflies can''t resist! All the whites: roses, carnations and lisianthus- the perfect gift for the birth of a baby. A classic basket arrangement. The perfect gift for a Golden wedding anniversary, 50th birthday or any special occasion. 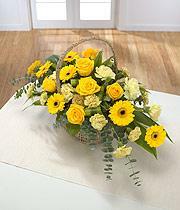 Includes roses, gerbera, carnations and foliage. A modern basket arrangement with pink roses and lilies taking centre stage complemented by delicate lisianthus and spray carnations. 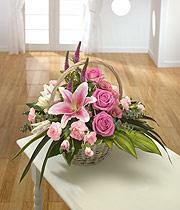 Stunnning pink roses are the stars of this basket arrangement. 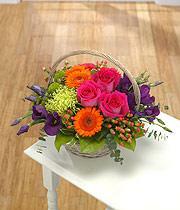 Zesty orange gerberas, purple lisianthus and hypericum combine to form this vibrant design.